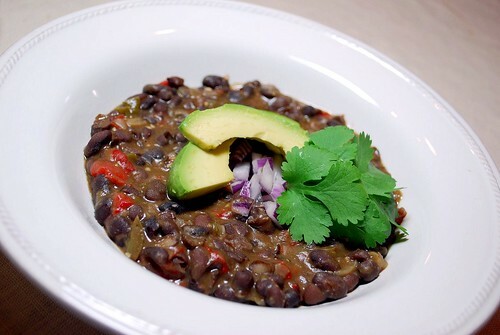 I love black beans, and it’s still cold enough here in Georgia to justify my cravings for nice, hot, steaming bowls of soup. Heck – we even have snow on the ground, lingering after the storm that dumped 6 inches on our little town over the weekend! This is exciting for those of us who only see a light dusting once a year or so! 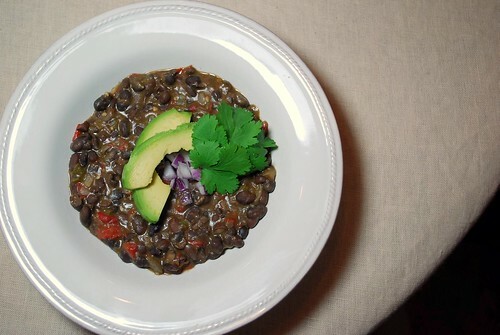 So I wanted a hearty, chunky black bean soup to warm us up. Forget all of your wimpy pureed soups – this soup is thick, filling, and delicious! Here is what I came up with! Heat olive oil in a large, heavy saucepan over medium to medium-high heat. Add onions, garlic, and peppers. Stir and allow the veggies to cook until the onions are translucent and the peppers become slightly tender, about 3-4 minutes. Next, add the beans, the water (use the bean-cans to measure), cumin, oregano, lime juice, salt, pepper, and bouillon. Bring the mixture to a rolling boil, and then reduce the heat to low. Allow the soup to simmer for about 1 hour, uncovered, until reduced and thickened. Serve hot with garnishes of your choice. 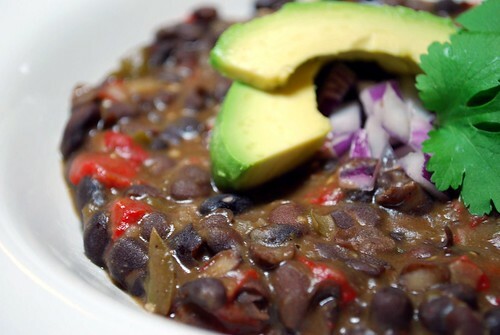 This recipe can be easily converted to a crock pot. Simply measure all ingredients into the crock pot. Cover and cook on low for 4-6 hours. Note: To make this recipe vegetarian, omit the chicken bouillon cube and the water. Substitute with 2 15-ounce cans of vegetable broth.